July 17th marks the 1st year anniversary of the Kettlebell Therapy™ blog. I wanted to express my deep thanks to all of you for your continuing support. It's been a fun experience filled with meaningful connections and growing friendships locally, nationally, and internationally via the powerful link we share through social media. 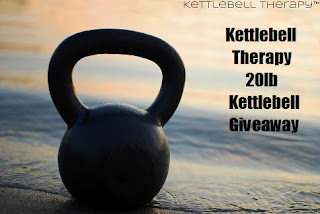 To mark this occasion, I am holding a kettlebell giveaway! The kettlebell is 20lbs and this giveaway starts on 7/8/12 and ends on the 7/31/12. Due to shipping considerations, only individuals in the USA and Canada are eligible to receive the 20lb kettlebell. Congrats Ben! Didn't know you started shortly after I did! Great idea for a contest, think I'll hold my own! Thanks, E! It seems like so long ago too! Very rewarding experience. Congrats on the anniversary! Keep being innovative and passionate- you do a great job inspiring a lot of people in physical therapy, including myself! What is my favorite kettlebell exercise? Swings, I'd have to say. Most recent fun thing is doing 1 hand swing+transfers for a minute straight. Other contenders: TGU. Or Goblet squats, or assymetrical deadlifts. Or whatever I'm concentrating on at the moment. Big +1 for single handed swings! That foundational exercise does SO MUCH good for the body. Really Grate and informative sharing! the reason the kettlebell is so great is that there's offset center of gravity, kettlebell is the definitive tool for developing the hip thrust, the power generator in all athletics.